My baby crownflower trees have been being eaten. It started slowly, but yesterday, I noticed a bunch of leaves were gone. Some of the seedlings were stripped bare. Crownflower trees are relatives of milkweed plants, also making them host plants for monarch butterfly caterpillars. 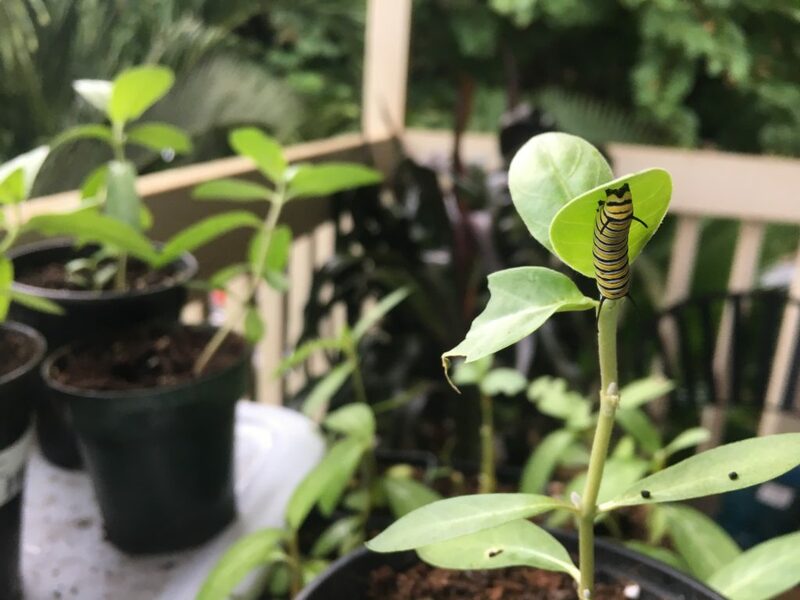 I have monarch butterfly caterpillars on my lanai! How exciting! I was really torn, because I’ve grown these crownflower trees from seeds, and I’m not just doing it for fun – I have plans to plant them. But I also like monarch butterflies, and would be willing to do a lot to help them. But would I sacrifice my baby trees for the caterpillars’ survival? It turns out, I don’t have to. I texted my coworker Andrea, because she raises monarch caterpillars in her classroom each year to show kindergarteners. When I showed her the picture, she said I should bring them to church today. She’ll keep them fed and safe until they wrap themselves in a chrysalis and hatch into a butterfly. Nice. One Response to One or the Other? A win-win! Thank you, Andrea, for providing that opportunity!